When women learn to protect patriarchy - sister-hood magazine. A Fuuse production by Deeyah Khan. Afghanistan is a country that has experienced more than three decades of war and its citizens have gone through some of the most difficult times. During these devastating wars, women have sacrificed the most. 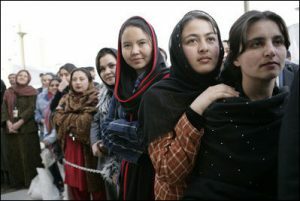 Women who lost their husbands or their young sons during the Mujaheddin and the Taliban, faced tremendous challenges and problems as they were left with little financial support in a patriarchal society where working women were not safe. Despite these challenges, sometimes they were able to save the rest of her family from the snare of the death. With the fall of the Taliban regime, women were able to gain some of their freedom back, but those who had lost their husbands during the war, faced new problems. Some were forced to remarry by their tribe while others had to provide food and clothing needs for their families by any means necessary in a society where opportunities for women are little. Today, I want to share the story and thoughts of my neighbor who had such a fate. My neighbor is a very kind-hearted woman. She has faced some of the toughest consequences of war and has horrible memories from her past. On top of that, I had heard repeatedly from my mother and my grandmother that she wanted her husband to take a second wife. It was very strange to me and I wanted to hear from her why she had made such a decision. It was the first day of Eid Al-Fitr. When she came to our home for Eid, I asked my grandmother to ask her about her situation. My neighbor immediately started to explain. “During the war, my husband was martyred. So, I was forced to marry my husband’s brother who is younger than me. (This is a common practice in our country.) Over time, I felt that this was an injustice against my new husband, because I was older than him. As a result, I decided that he needs to take a second wife. His marriage would make me feel better. My husband does not want a second marriage, but I will force him to marry a woman who is younger than me,” she said. “When your husband does not have a problem with you and does not want to remarry then why are you forcing him to do so?” I asked her. I tried hard to persuade her to change her mind and stop blaming herself, but I didn’t succeed. She spoke of her conscience and that she felt sinful for marrying a younger man even though she had been forced into the marriage herself. But here is the question, given she was forced to marry her current husband, why should she feel guilty? Do men who choose to marry teenage girls feel guilty? How about older men who marry young girls and have multiple wives at the same time? Does their crime not count as a sin and hurt their conscience, or do they not even have a conscience? Why should women have to sacrifice? Unfortunately, these ways of thinking have been carved into the minds of a large number of Afghan women by this misogynistic society. These ideas have been imposed on them so much that they have come to believe that women are inferior to men and therefore they must behave in accordance to the wishes of men. Many women don’t see themselves as worthy of love and acceptance. They respect themselves only as secondary to the men around them. They were never told that women also have the right to be loved, to choose, to express their wishes, opinions and ideas, and to participate in social activities. Throughout history in our male-dominated history women have sacrificed their respect, freedom and choice to adhere to patriarchal rules. Even now when they decide to stand up to injustice they face more violence and discrimination. Today, the so called “religious scholars” and their supporters abuse religion to attack women who have become aware of their rights. Women who believe in themselves and in equality are called “infidels” or “followers of Satan.” The radicals consider disrespecting and fighting against these women their religious duty, but where are these “religious scholars” who claim to have fought for the freedom and honor of this country, to give a piece of bread to the child who is living in hunger? And where are these defenders of “honor” to prevent this child’s father from getting his head chopped by the extremists? And why don’t they cry “Islam” when a four year old girl is raped? What gives me hope is that even in these dire situations, a large number of Afghan women are standing to fight injustice and violence against our fellow human beings. I, too, will fight alongside my sisters. This piece was translated to English by Maryam Laly. A volunteer for Free Women Writers, Maryam is passionate about human rights issues. She has a degree in Government with minors in Peace Studies and Arabic from St. Lawrence University.